alaTest a collecté et analysé 30 avis de consommateurs et d'experts pour le produit Cuisinart Grind and Brew Thermal 12 Cup Coffee Maker. La note moyenne du produit est 3.7 sur 5, tandis que les autres produits de même catégorie ont une note moyenne de 4.2 sur 5. Les testeurs apprécient le comfort d'utilisation. L'ergonomie impressionne, mais de nombreux avis sont moins positifs sur le bruit. 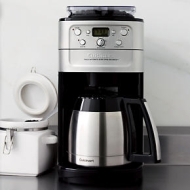 Après analyse des notes de consommateurs et d'experts, de l'âge du produit ainsi que d'autres facteurs, et comparé aux autres produits de même catégorie, le Cuisinart Grind and Brew Thermal 12 Cup Coffee Maker obtient un alaScore™ de 80/100 = Très Bien. I am happy with the various sizes of the bowls and they are satisfactory for my purposes. One of the bowls was broken when it arrived, but a simple phone call took care of it and they sent out another one within a few days. We LOVE this coffee maker! I was reticent at first to purchase a $200 coffee maker, but this is the only one I've found with all of the features I wanted: programmable, thermal carafe, included bean grinder. Great Coffee. Huge Pain in the A**. In theory this should be a great little coffee maker. I REALLY want to like it. In reality, however, it's almost more of a hassle than it's worth. We have really enjoyed our new coffee pot, however it can be a little bit loud while grinding the coffee and has clogged due to the oil from the coffee beans. With that said, it was super easy to clean out and it does make a great pot of coffee. Let me start off by stating that I think Cuisinart makes one of the best quality, reliable and cost effective appliances out there.